I'm going to keep this update as simple as possible. The S&P 500 (SPX) is hinting at the potential for a base to form in this zone. 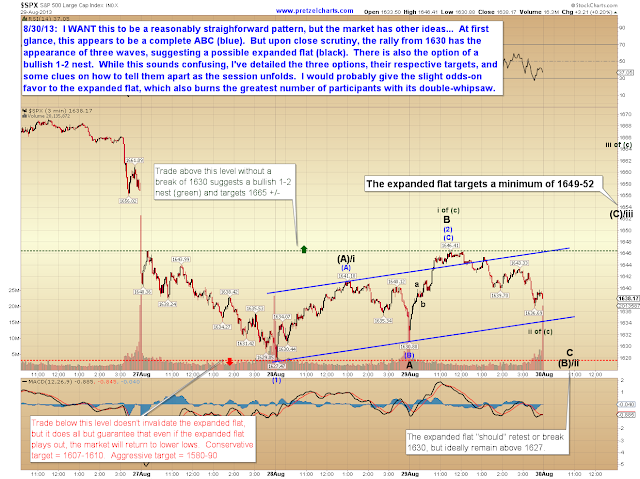 There are several options for the near-term, and I've done my best to detail and outline their paths and what to watch for, as well as their first target zones. We have a three-day weekend approaching, and the session prior to three-day weekends is often light volume, which gives those sessions a bullish bias. Fund managers know they can't put big sell orders into a light-volume market without causing major havoc. As a result, approximately 70% of the time, the session prior to a three-day weekend closes green. 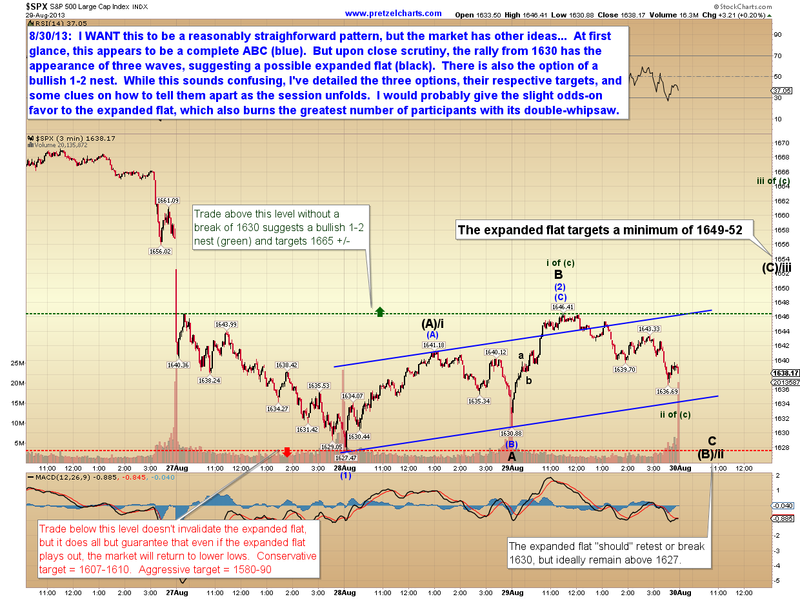 The chart below covers the most likely possibilities for the short-term. I'm slightly partial to the expanded flat (shown in black), since it would burn the greatest number of participants -- it allows for a retest of the 1627 low, while whipsawing the 1630 low. On the hourly chart, the market has so far found support at the noted black trend line, which is the red ii/iv trend line -- an important intermediate support zone. 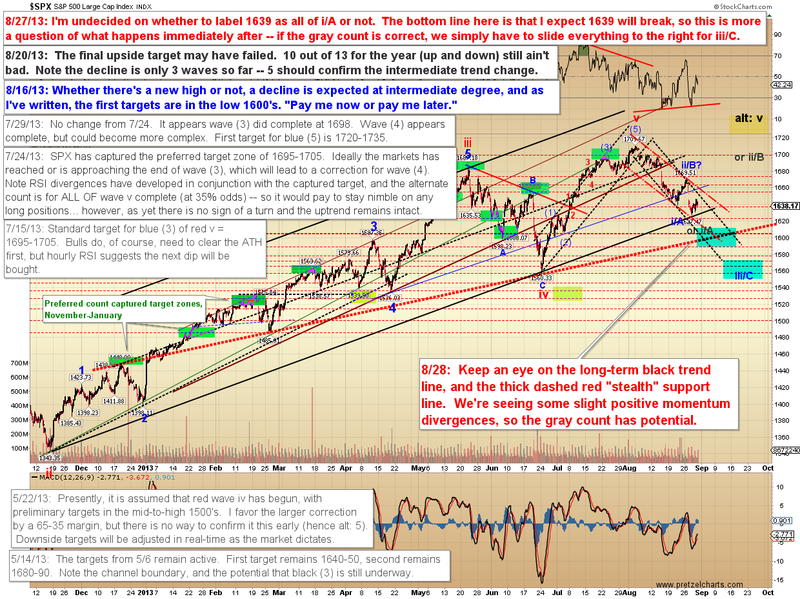 This allows the possibility that the wave ii/B bounce will develop from here. In conclusion, I remain bearish on the intermediate term, but the market is hinting at the possibility of at least a short-term sideways-up phase. Depending on how that develops, there's potential for the larger wave ii/B bounce to develop from here. Ultimately, though, I expect the next bounce will be sold to new lows. Trade safe, and have a great weekend!